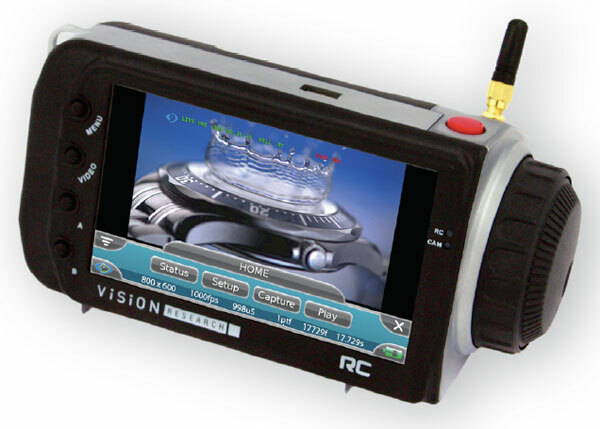 From the VRI website: "Our new Phantom Remote Control Unit is a 5" life saver! This small, lightweight, hand-held device controls your Phantom digital high-speed cameras as well as a providing a video monitor all in one package. The RCU supports the entire high-speed imaging workflow. Set up the camera, trigger the shot, view the cine on the LCD screen, trim to the frames of interest, and save the result to a CineMag. Without ever touching the camera! The 5" TFT touch screen technologyallows you to control a camera with just the tap of your finger. A scroll/jog dial gives you an alternate (and fast!) way to change many settings or to scrub through a recorded cine." Hmmm.. seems like they've been inspired by the Weisscam ;) Seriously though, interfacing wirelessly for high speed recording makes a lot of sense and it's one the most useful features of the Weisscam. I've never been a huge fan of the Phantom control software and this to me seems like it will make the workflow faster and more intuitive. The unit will probably be expensive too and I don't predict it will be something thrown in with the package for nothing. It's not really a necessary accessory and "operator comfort" isn't production's highest priority so this may be a hard sell from a rental perspective. I REALLY hope to find one in the case on my next Phantom job though. Less cable. Less laptops. Less headaches. Sign me up.